Daniel Benoliel’s solo show about fatherhood. Becoming a father is one of the most significant things that can happen to a man. In his humorous and often moving solo show Daniel Benoliel presents an account of his own journey into fatherhood: after the death of his own invalid father in 2006 Benoliel made a discovery about the murder of his great-grandfather. It was during this difficult time that his wife asked him to pick up a pregnancy test at the shops and he discovered that he too was to be a father; hardly ready to grow-up himself, let alone raise a child of his own, Benoliel looks back across the generations and ends up learning what it means to be a good dad as he investigates the circumstances of his great-grandfather’s murder. 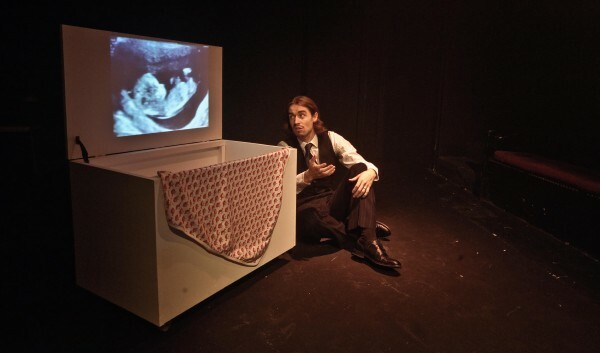 This type of theatre can go one of two ways: comic accounts of personal stories can sometimes chime amusingly with an audience’s own experiences but they are also often in danger of descending into protracted self-indulgence. Thankfully, Benoliel’s show falls into the former camp. Although, as one half of duo The Roaring Boys, he’s an experienced comedy performer, this never feels like an extended stand up routine – it’s closer to a comic lecture on dealing with one’s responsibilities. The result is a meticulously scripted piece performed with a degree of theatricality; there’s a strong narrative drive to the writing and the show, directed by Tom Cornford, is generally well paced and engaging. The performance space has been painted black and is bare save for a white storage chest and a single chair. It’s a stark, simple staging but it enables the audience to focus on Benoliel’s story. The versatile chest is used to represent everything from a cot to a coffin while video snippets, documents and photographs, are projected onto its opened lid. This visual device helps to give some necessary shape to what might otherwise have been quite a static production. Despite the focus on death, the piece works well as a comedy and there are plenty of laughs, albeit gentle ones – the laughter of recognition. Benoliel is clearly a talented comic writer, witty and capable of irreverence, and though his story might be a little unusual it’s very humanly told. The production does drag a little towards the end – there are a few moments that feel forced and awkwardly over rehearsed – but the show’s brevity (it’s only 45 minutes long) works very much in its favour – it doesn’t over-stretch itself. Waiting Like a Man is an interesting take on what might otherwise have been over-familiar thematic ground and Benoliel’s energy, charisma and confidence as a performer help to counter the show’s less satisfying elements.